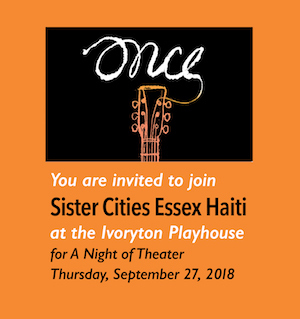 ESSEX — Sister Cities Essex Haiti is joining with the Ivoryton Playhouse for “A Night of Theater” on Thursday, Sept. 27. The evening begins under the tent with a pre-show cocktail and light fare reception 6 to 7:15 p.m. “Once” cast musicians will stroll through the tent and entertain during the reception. The 2012 Award winning musical “Once” begins at 7:30 p.m. “Once” is an unforgettable story about going for your dreams and the power of music to connect us all. It is winner of eight 2012 Tony Awards. Enjoy dessert and meet the cast immediately following the show under the tent. For tickets visit, info@sistercitiesessexhaiti.org or call 860-227-0848. Tickets are on sale through Monday, Sept. 17. Proceeds from this event will enable Sister Cities Essex Haiti to continue its good work in Deschapelles, Haiti by providing funds for the operation of the Deschapelles Community Library and projects in Music, Tennis and Early Education Teacher Training. Essex and Deschapelles are Sister Cities.